Being one half of a couple has its financial benefits. Combined incomes can offer a stronger financial outlook and create more disposable income, allowing some couples to buy homes, upgrade to bigger places, build emergency funds, and travel, among other luxuries. Likewise, married couples filing joint tax returns might receive additional tax savings compared to single filers, helping them get ahead faster. But couples aren't the only ones enjoying economic advantages. Singleness has its rewards, too — like eating all the cookies without judgment, and many other perks that'll make you appreciate your independence. Take a look. No one is suggesting you become a workaholic and sacrifice relaxation or fun for the almighty dollar, but being in a relationship consumes a good portion of your time and energy, which can limit the amount of time you're able to work. When you're a single person with nothing holding you back, there's more time to focus on your career. And there's the opportunity to work longer hours with your employer or freelance on the side for extra money. Your extra cash can go toward achieving financial goals such as paying off debt or building a sizable savings account. 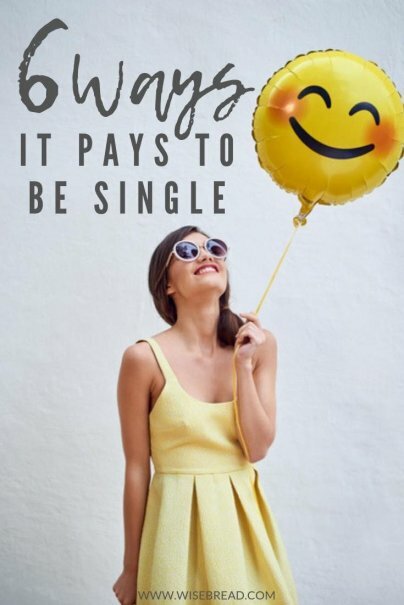 Being single also gives you the opportunity to pick up and move if you're offered a better job somewhere else. You don't have to confer with a partner or worry how the move will affect their life. You work, so technically you can do whatever you want with your money. But when you're one half of a twosome, consulting with your partner about purchases (especially larger ones) can deter arguments and keep you on the same page financially. If you have financial goals as a couple, your partner could discourage or veto your plans for buying an item. Being honest and having discussions about finances (and decisions regarding other matters) keeps the relationship strong, but relinquishing some of your freedom might be frustrating, too. As a single person, you don't have to consult anyone before spending or making decisions. If you want something and can afford it, buy it. If you're in a relationship and purchasing a house or car together, lenders often pull both of your credit scores and use the lowest of your two scores when determining the interest rate. So if you have great credit and your partner doesn't, you could end up paying more for financing. 4. Money arguments? What money arguments? Another bonus of living the single life is not having money fights with another person. Some people get into relationships with people who aren't their money match, meaning they have different mindsets with regard to budgeting, spending, and saving. One person might be a saver while the other person is a big spender, or vice versa. These differences can cause problems and lead to arguments. Two people living together need more space than a single person. This often requires a bigger home, and a higher monthly payment, despite sharing expenses. If you're a single person committed to living cheaply, you have more options than a couple. Since it's just you, there's the flexibility of renting a room in a house with a bunch of roommates and splitting expenses two, three, or four ways (did that in my 20s; loved it! ), or rooming with your folks a little longer to save money (did that in my 20s, too; didn't love it so much). Couples don't always have these options, which means they end up spending more on housing and having less disposable income. Get away with living cheaply while you can. It may not always be this way.